GBA Pokémon: Ruby Version (USA) in 1:31:45.43 by FractalFusion & GoddessMaria. Pokémon: Ruby, Sapphire and Emerald form the third generation of Pokémon, after Pokémon: Gold and Silver. Noticeable differences include the graphics and interface, Pokémon abilities, and running shoes that allow the player to move around much faster in the outside overworld before getting the bike. FractalFusion and GoddessMaria complete the game in a mere 1:31:45, 3 minutes and 22 seconds faster than the previous Sapphire Version run. 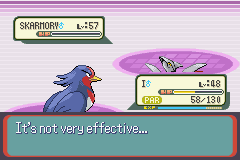 Instead of using Machop/Machoke, this run now uses Taillow/Swellow, which is obtained far earlier in the game, also has Guts as an ability, and has powerful moves early on and throughout. The movie also uses advanced methods of luck manipulation with the help of RNG analysis. For more details, see the submission text. Note: To play the vbm, you need to have Real Time Clock on and use Flash 128k as Save Type. Real Time Clock is for sync, while Flash 128k is to prevent the game from giving a white screen.